I was out of town for a few days so episode #101 is a solo show, but I did not want to leave you, the amazing listeners without some fresh content for the week! 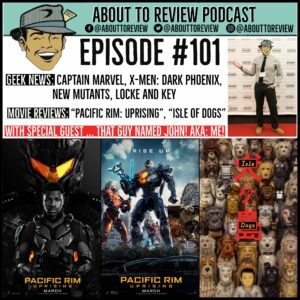 I go over the geek news, then review two movies which are in theaters now: “Isle of Dogs” and “Pacific Rim: Uprising”. Join me on this strange and wonderful journey during which I talk to myself in the studio for over 30 minutes. There will come a day when I am comfortable doing shows by myself, but that is not this day. Enjoy! Guest info: Me! Your friendly neighborhood film critic!